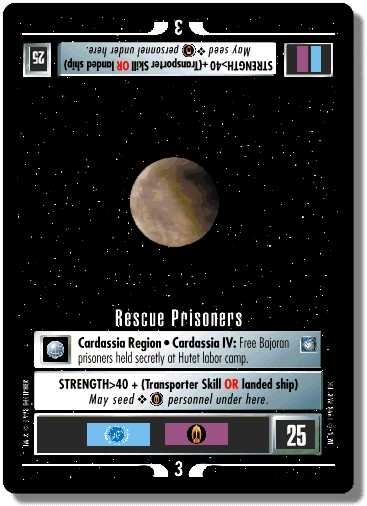 Cardassia Region • Cardassia IV: Free Bajoran prisoners held secretly at Hutet labor camp. Mission located in Alpha-Quadrant with span: 3 and points: 25. Special Instructions: May seed ❖ Bajoran personnel under here. Characteristics: Cardassia IV, Cardassia Region, Mission. There are 19 entries for Rescue Prisoners (ST1E 5 S 125) at the Tradeplace (12 haves and 15 wants). Click here to see all trade list entries for this Starter card!